Summer is quickly approaching, so it will soon be time to head outdoors to do some entertaining! In homes today, it is fairly common to see outdoor spaces become an extension of the indoor living areas. I wanted to share a design board that I recently completed as part of a Hayneedle-sponsored project. It reflects the "indoors outside" design concept. Great rooms that combine open-concept living and dining areas are a popular layout in today's homes. It's the way families live nowadays! The outdoor room that I designed above follows this "great room" concept. The room is furnished and accessorized as if it were a true indoor space (but with outdoor-friendly materials). The vibrant color scheme and consistent geometric patterns connect and unify the "two" spaces. 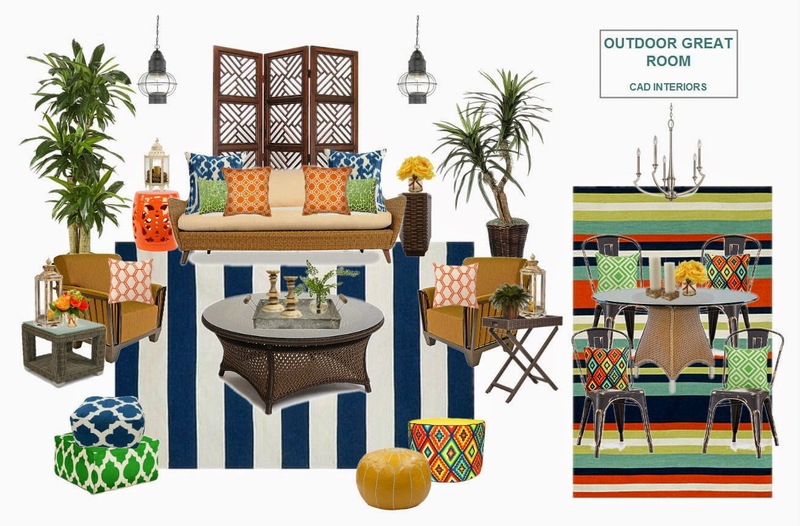 Read here about some simple ways that you can update your outdoor spaces for summer entertaining!